Editor’s Note: Andy Anderson looks around and ahead toward fixing a now broken appraisal profession. The appraisal profession was not broken. Just like other professions, there were (and are) some bad actors, but appraising was not broken and should have been allowed to do its job correctly. That is not what happened during the unrealistic property value increases of the lender-created real estate bubble and it is not what is happening today. Here’s how to fix it. Appraisal fees for an independent appraiser should not be directed or controlled by anyone except the independent fee appraiser responsible for determining the scope of work necessary to complete the assignment in a competent and credible manner. Customary and reasonable appraisal fees, a concept originated by HUD, can only be determined by accurately defining what a customary and reasonable assignment is, as determined by a local, experienced appraiser. Each and every assignment can require a different level of education, experience and competence to complete in a professional manner, dictated by many factors, including but not limited to location, population, market activity, data availability and the complexity of the property and improvements. Each and every assignment requires the adequate time necessary to complete the request in a diligent and competent manner. The turn time of the report should not be dictated in a manner that compromises the appraisal, resulting in a less than credible assignment conclusion. In compliance with Title XI FIRREA of 1989, and again with Title XIV of 2010, the appraiser is responsible, per the Uniform Standards of Appraisal Practice (USPAP), to determine the necessary scope of work to produce credible results- not a client and not an AMC. While lender and client requirements need to be met, the final determination rests with the appraiser. There are substantial differences between a professional appraiser and what I call industry appraisers. The professional appraiser provides a service to the client that goes beyond the ability to fill out a form and complete the requirement for an appraisal to be included in the lender’s loan package. All “other than lender/AMC” users of valuation services desire diligent, accurate and professionally-completed and credible valuation results. They seek out and compensate professional appraisers for their expertise and allow adequate time necessary to produce supportable, defendable and credible results. While there are many professional appraisers who feel they are “stuck” providing services to major banks, lenders and AMCs to stay in business, the professional appraiser does not compromise the quality and diligence because of low fees and turn time requirements. That is professional integrity. In contrast, many appraisers were and are providing a product that is dictated and controlled by lenders and AMCs to cosmetically appear to adhere to federal regulations; the very regulations that require the lender to include an appraisal report in the loan package. The lending industry is the only user of appraisal services who desires fast and cheap appraisal reports and has come to rely primarily on a certain segment of appraisers to provide them. These appraisers- industry appraisers, are expected to complete diligent property inspections, competent research and analysis, and credible and reliable results in less than adequate time: often 48 hours or less. And they do. Many appraisers who work for less than adequate compensation were taught by supervisors who provided unfair fee splits during training. Many industry appraisers were improperly trained by supervisors who went so far as to lie about hours and experience on the trainee’s experience logs to capitalize on the opportunity to make a fast buck in the real estate bubble. The real estate crisis was fueled by greed. Some of these appraisers feel like they were done a great disservice by their “mentors” and have told me they would like to learn how to become professional appraisers. Third party service providers became a primary source for fast and cheap appraisals during the recent real estate bubble in an effort for more and faster profits. AMCs are utilizing industry appraisers in many cases. The result for consumers is lower quality appraisals with no cost savings. The public has not seen any savings since the fees charged by the third-party providers are similar or higher than what professional appraisers charge in the same geographical area. The low quality of appraisals can be confirmed by the thousands of loan packages and appraisal reports being reviewed daily by the GSEs, banks and lenders, which are proving to be less than reliable, credible and acceptable. The general public deserves the protection of completely ethical, unbiased and uncompromised appraisal reports. In an effort to protect the consumer and the investor, the professional appraiser must be allowed to openly compete with other professional appraisers in a given market area. That AMCs are able to dictate fees and turn times, that only industry appraisers are willing to accept, results in a disservice to the public and investor. The appraisers who are required to sign contract agreements and fee schedules dictated by AMCs are being treated as though they are employees of the AMC and not independent fee appraisers. Many of the professional appraisers who will not sign AMC agreements are slowly but surely going out of business. The consumer should never be charged more for the appraisal report than the professional appraiser is paid to complete the report. It is not the consumer or the appraiser’s responsibility to pay for the cost of locating and engaging a competent appraiser and the inclusion of a credible appraisal report in a loan package. Given this, a true “customary and reasonable” fee would be the fee charged to the buyer. The HUD One should only reflect actual fees and charges paid to the appraiser under the title of “Appraisal Fees.” Any third party fees and charges should appear on the HUD One separately and be clearly identified for the consumer to understand. The government, lenders and AMCs do not have the authority to dictate what fees and charges are acceptable and will result in services that are in the best interests of the public and the financial security of our families, communities and our nation. Paying a dictated and mandatory customary and reasonable fee does not ensure the public that only competent and diligent appraisers are completing their appraisals. The fact that an appraiser is Licensed or Certified does not by itself assure the client or consumer that the appraiser has the adequate education, experience and ability to complete the assignment correctly or at an equal level with other licensed and certified appraisers in the same geographical market. The focus needs to be the protection of the public. It is time to educate the public to the fact that the appraisal fee they are charged by most lenders is NOT what the appraiser is paid to complete the appraisal report. If I am charged $500 for an appraisal, I expect to get a $500 appraiser. So does the public. The Dodd-Frank Financial Reform Bill said that Licensed and Certified real estate appraisers shall be compensated at customary and reasonable fees for appraisal reports completed for federally regulated transactions. Yet, a legally enforceable definition of “customary and reasonable” has not been determined. I am not sure this is possible. “Customary and Reasonable” is arguably one of the most ill-conceived notions in the Financial Reform Bill, though there are many. Professional appraisers know what usual and customary charges are for real estate appraisal services in their area and should be able to command adequate and outlined fees in the free market. “Customary and Reasonable” fees are only necessary to determine profit margins for third party servicers. Precedence has been set in the medical and dental fields to determine customary and reasonable fees to be paid by a third party, such as an insurance company. Customary and reasonable fees have been determined by establishing the usual and customary charges of medical professionals located in a given market area. 1. Fee that is the most consistently charged by physicians for a particular procedure. 2. Fee that is usual for a particular procedure charged by the majority of physicians with similar training and experience within the same geographic area. 1. The fee that is the most consistently charged by the professional, independent, appraiser for a particular appraisal assignment. 2. Fee that is usual for a specific and particular appraisal assignment charged by the majority of appraisers with similar training and experience within the same geographic area. Conventional, VA and FHA appraisal assignments have distinctly different inspection, reporting and knowledge requirements. FHA appraisal charges should be higher than VA appraisal fees when the FHA-required inspection and report are completed accurately and competently. VA fees, while closer to actual usual and customary fees for FHA appraisal assignments, are not acceptable to set minimal or mandatory fees for conventional appraisal assignments. VA fees have been set by surveying the usual and customary charges by the appraisers on the VA panel and take into consideration all of the VA requirements that need to be learned and adhered to by the VA appraisers, including the willingness to accept complex assignments at the same compensation as the less-complicated assignments. 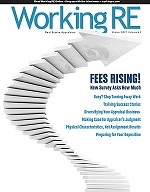 Accepting VA fees and becoming a VA Appraiser is a business decision; similar to the banks having fee panel appraisers that would accept slightly less per appraisal for volume. Also, the veteran-buyer is never charged more than the VA appraiser is paid for the completion of the appraisal report. The decision to accept less than adequate compensation and to complete a report in less time than is acceptable, to adhere to unrealistic turn times dictated by AMCs and lenders, are business decisions. When an appraiser accepts compensation and turn times that are less than adequate, that appraiser has made a statement to the client and the industry that those fees and turn times are “customary and reasonable” for that appraiser. Not for me. To date I have not signed a single AMC agreement or contract. The only AMC orders I have completed were compensated at my determined charges and my turn times as determined on a case by case basis, based on the complexity of the assignment. Approximately 30-40 percent of my appraisal work is “other than lender”* and that percentage is growing. The appraisal profession was not broken, but it is now. It will require diligence and dedication to rebuild what has always been the most important part of home buying: a completely unbiased and uncompromised real estate appraisal, completed by ethical and experienced real estate appraisers, to determine a credible and reliable property value at the time of purchase or refinance. Mr. Anderson has been a professional, independent appraiser for 27 years, specializing in complex, mountain, agricultural and manufactured housing, expert witness for value and construction, insurance appraisals, probate, estate/tax appraisals, etc. He is a VA, FHA, Cal Vet approved fee panel appraiser. He is an author and instructor for appraiser Continuing Education and has been known to mentor any appraiser requesting his assistance.